Scheduled Rain Date for Paperhand Puppet Intervention Live Show! — Official site for Southern Village, Events, Dining, Movies and more. Scheduled Rain Date for Paperhand Puppet Intervention Live Show! Weaver Street Market and Johnson Lexus of Durham have teamed up to bring the Second Annual Paperhand Puppet Intervention live show to the Village Green! 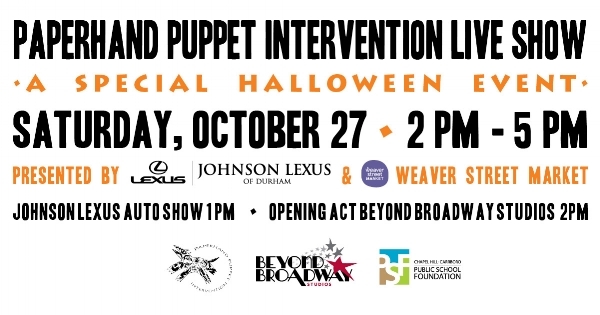 1:00 pm Johnson Lexus will display automobiles on Aberdeen Street and at 2 pm Broadway Bound Studios will kick off the event with an Opening Act (think "Thriller") followed by Paperhand Puppet Intervention! Admission to the event is $5.00 per person to benefit the Chapel Hill-Carrboro Public School Foundation. Thank you for your support of the Chapel Hill Public School Foundation and thank you to our wonderful sponsors! Paperhand Puppet Intervention Live Show!